This OSHA and ANSI approved hardhat features an adjustable 4-point ratchet suspension with padded forehead strap for a comfortable fit. The high visibility colors makes this hard hat a great choice for safety workers, search and rescue teams and industrial use. Always use protective head gear when working in hazardous conditions, especially during search and rescue situations. Select color choice from dropdown box. 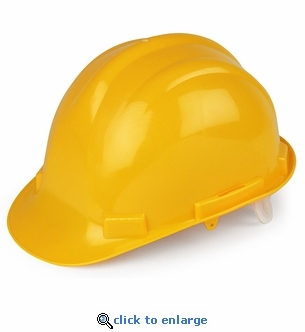 OSHA and ANSI approved hard hat. Colors Available: Yellow, Green, Red, White and Blue. Adjustable 4-point ratchet style head strap.